What will reach it's final issue first; Sandman: The Overture or The Multiversity? The latter is THE comic project I have literally been waiting years for, since hearing about how each oversized issue features a distinct universe of heroes from the various corners of the DCU, joined by the fact a comic is trying to warn each world their armageddon is now, and how the heroes respond. 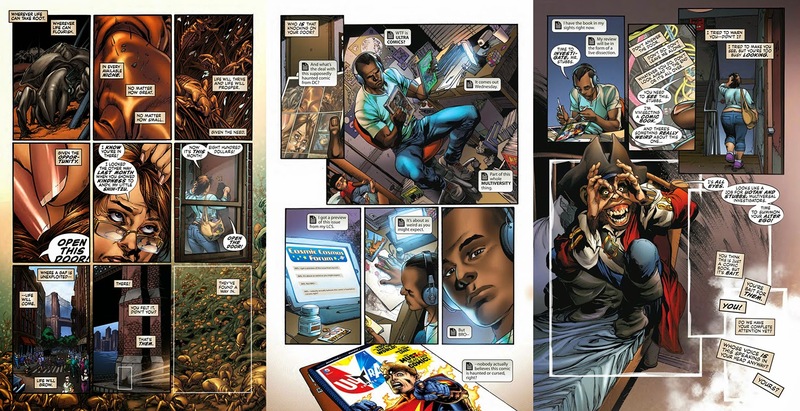 Even in it's concept it highlights what I think DC is when it's not trying to shove a Twitter device into the hands of every Teen Titan (or on the series covers) in their latest greatest teenaged marketing push. Right from the cover shown, the new Captain Carrot, Abin Sur and more almost threaten you to try associating them to either the classic DCU continuity or the current 52. The fact that the series lightly can be associated to either, but is more of a stand alone epic, is a stroke of genius probably attributed more to writer and ideas man Grant Morrison, than it is any editors that may have dared stand in his way. Just this preview alone has ideas both big and small overflowing from every page. The logo is one of the best of the year and it all starts with headlice and a tribute to the iconic Flash cover of the Silver Age Grant always tips his hat to. Click to embiggen and enjoy. 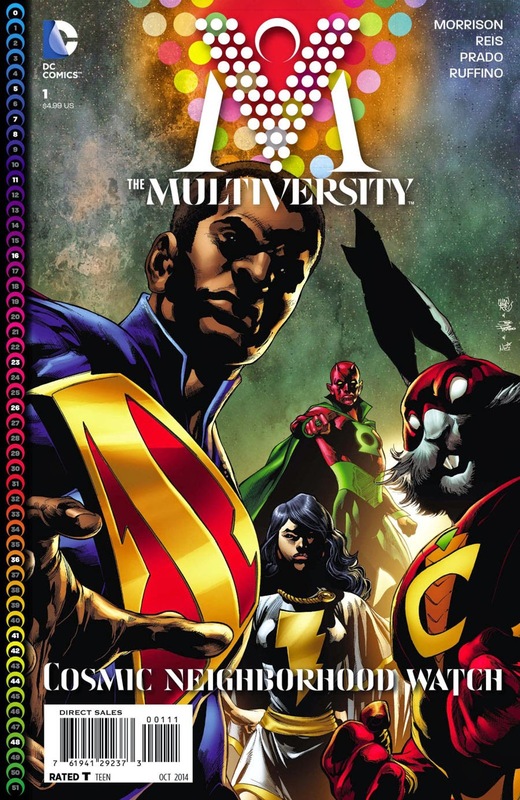 Multiversity is coming (in stores next week), and no matter how many issues it gets, for this fan, it will never be enough. DC says: The biggest adventure in DC’s history is here! In issue #1, pencilled by superstar artist Ivan Reis, President Superman of Earth-23 uncovers a threat to all reality so apocalyptic, it will take a team of incredible heroes from across the Multiverse to face it – including Captain Carrot, like you've never seen him before! Looks good, looks damn good. I just hope it's easier to digest than Final Crisis. Looking forward to seeing the exploration of all those worlds though. I've already got less heartburn from one preview than I did from one box of Final Crisis. So I think it's already beat that Dale. The moment I ducked from Final Crisis was the updating of the New Gods being announced. Don't get me wrong, as a fan I love Morrison like my older step-cousin twice removed, but NO ONE touches Kirby like that, especially on characters like The New Gods. 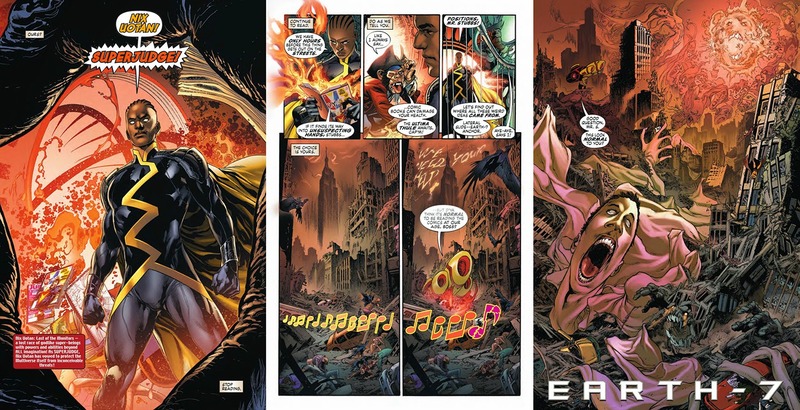 Hopwever Batman's 'death' and how it was hamhanded with Batman R.I.P. just wreaked of editoral handprints.